Mrs Freedman was a philanthropist, who believed in the importance of education for young women and was a very generous supporter of music and the arts. 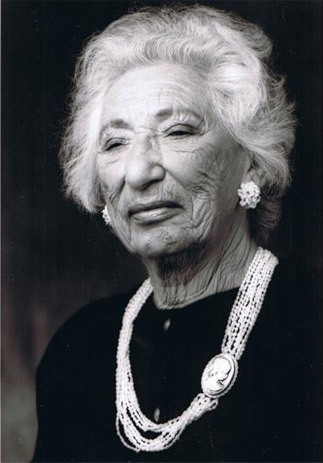 Mrs Freedman who donated significantly towards the venue's construction was able to enjoy many performances in the Centre before her death in 2006. She also endowed three Arts Scholarships for students at EGGS which continue to be awarded annually in her name. Rachel Raye Ginsberg was born in Winnipeg, Canada in 1909. After an early career as a teacher, Raye arrived in New Zealand in 1942 with no more than $4 in her pocket. She then worked as a speech therapist before becoming a female pioneer in the male-dominated world of property management in NZ. She was a woman of many talents and became a very successful self-made businesswoman and property developer. In 2003 Raye made an extremely generous donation to the RFAC project. Although she wasn't an Old Girl of Epsom Girls Grammar School, a lifetime of work had ignited a desire to leave something behind that she could see being enjoyed. Raye passed away at 96 years old. Her life was celebrated by many people who knew her as a woman of generosity, humour and great spirit. The Epsom Girls Grammar School community was profoundly touched by Raye and remembers her fondly. More recently the Raye Freedman Trust Board has approved a grant to The EGGS Foundation of $200,000 to ensure the sustainability and reputation of the Raye Freedman Arts Centre. The grant has been used to further develop the equipment and resources including a stage extension over the orchestra pit, which greatly enhances the theatre's acoustics and provides flexibility and intimacy for contemporary theatre. Raye Freedman's legacy and generosity will always be remembered and appreciated. "HER LIFE WAS CELEBRATED BY MANY PEOPLE WHO KNEW HER AS A WOMAN OF GENEROSITY, HUMOUR AND GREAT SPIRIT."